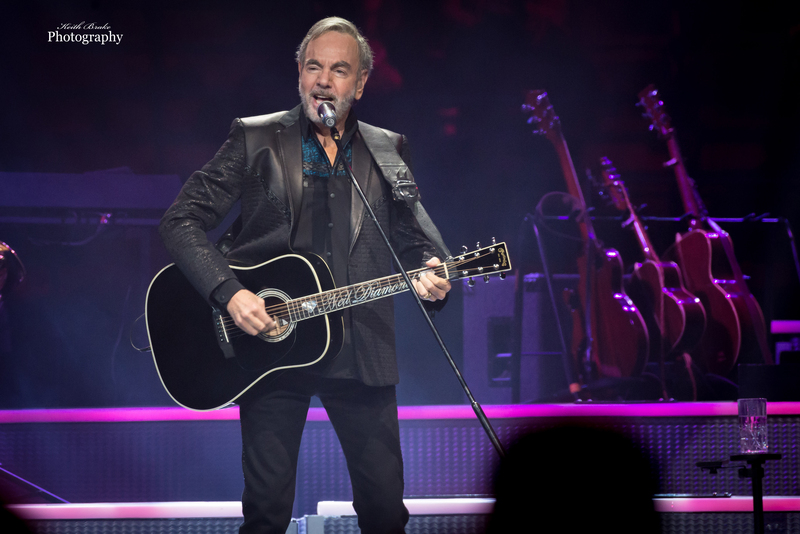 This past Wednesday Neil Diamond made the third stop on his 50th Anniversary Tour at Scottrade Center in downtown Saint Louis. When you think Neil Diamond a few questions may come to mind. How old is he now? 50 years…really? Wonder how he sounds after 50 years? Well, he is 76 years young. Yes, 50 years and he still sounds as smooth as the first time you heard him sing. Oh yea, by the way, he STILL turns the heads of women all ages. Neil tours with a thirteen piece band that has been with him “almost from the beginning” he said while introducing them. The band includes horns, back up singers, percussion, guitar players, bass guitar, drums, accordion, harmonica and probably other instruments I didn’t notice. Two interesting side notes, the backup singers are siblings, and amazing by the way. Secondly, two of his guitarists are a father and son duo. The band as a whole is an amazing unit of precision and timing and incredibly talented, easy to see why he has kept them together. 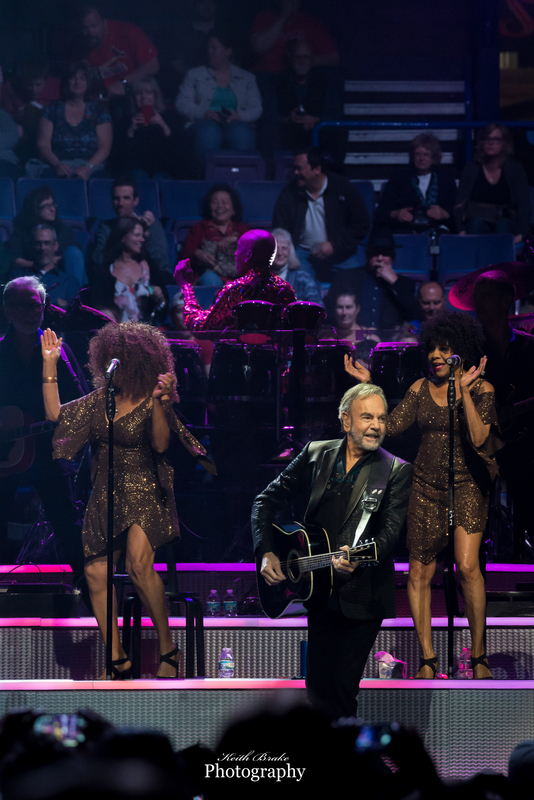 Neil took the stage surrounded by adoring fans of all ages and it was immediately obvious that this show was going to be special. The show started with “In my Lifetime” and from that very moment Mr. Diamond had the undivided attention of everyone in the room. From the very beginning he roamed the stage from side to side, front to back, guitar in hand, as if he wanted to welcome everyone personally. Neil’s special way of engaging the audience makes a large room seem somehow smaller and more intimate. No supporting act is necessary for this tour. Neil and his band took the stage and proceeded to play for an amazing two plus hours. Some artists may avoid long sets for fear of fatigue marring the later songs, but not this music legend. His vocals, energy and stage show never faltered and the band mates followed in perfect suit. Highlights of the evening include a prompted sing-along to “Song Sung Blue” with almost 13 thousand of his closest friends. The encore kicked off with “Sweet Caroline”. Simply put, it is possible that no better vibe exists than being in a room with thousands of very happy people singing this song. The experience is pure magic. With 50 years of material under your belt it could be daunting to choose a fitting set list. This also was completely on point. The set list did not allow for one single dull moment but did allow for the emotions to swing from fun to more serious back to fun. It was a perfect blueprint for the evening. The next stop is Omaha NE, and if you are anywhere near, I highly suggest catching this tour. 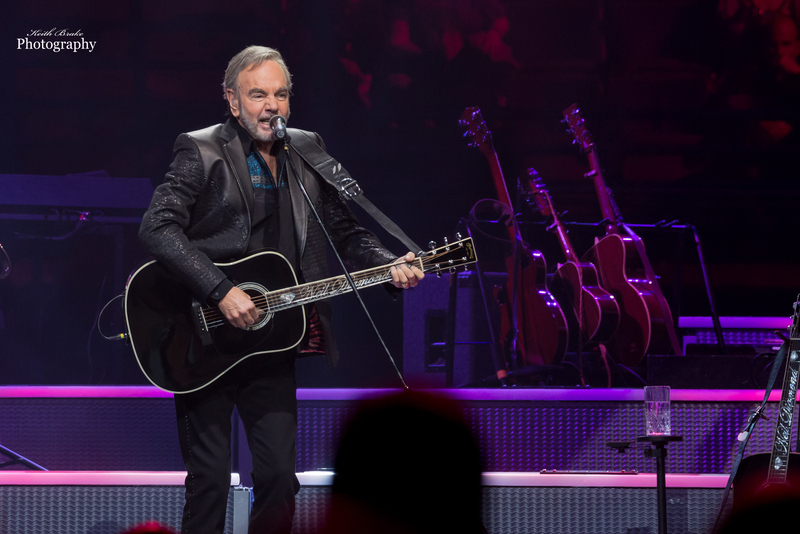 For more dates and information about Neil Diamond, please visit www.neildiamond.com/ . Awesome reading and pics. So cool that his backup singers are his siblings. Thanks Mike, it was a great show for sure. Couldn’t find a way to edit the above post. I meant to say that it was so cool his backup singers were siblings. Not ND’s siblings. An absolutely fabulous concert! I have always enjoyed his songs and him giving his All to the audience the entire evening. I missed out on a T Shirt! Is there a site I can still order one with sparkles? Love to get one! You might try his website. I don’t know any place else that would sell that. Good luck!